Meeting the last "grey wolves"
Six of June, 1944... D Day. At around midday came from Berlin a message read by admiral Dönitz to all U-Boat crews : “Every enemy ship carrying to the ground only half-a-hundred of soldiers or an armored car, is a target and becomes the aim of all U-Boats' missions. She must be attacked, even at the risk of losing one's own boat… Any boat which will cause losses to the enemy during the landing, even if she doesn't meet other success, will have performed the highest tasks and will have justified there her existence”. 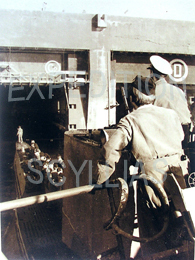 For the crews of German submarines which are going to be committed in this operation, there is no doubt that it is an order of collective suicide and that they are going to leave for their ultimate mission. Last-ditch struggle because the Channel will become their grave, and they know it, but German submariners never have failed in their duty ! 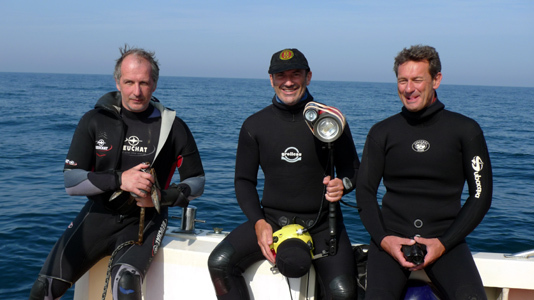 About seventy years later, the Breton divers of l'Expédition Scyllias answered the invitation of their Norman friends of Corsaires d'Ango and of its founding president, René Tamarelle, diver and finder of outstanding shipwrecks, whom accompanied the draftsman Michel Torché. The purpose of this expedition was to go and meet four of these German submarines sent deliberately to the death in order to counter the Landing : U 741 (1 survivor), U 671 (5 survivors), U 413 (1 survivor) and an unknown U-Boot (no survivor identified). It was a real challenge because these U-Boote wrecks (or supposed to be) are difficult of access, all laying between 30 and 40 miles from coasts, sometimes closer to England than to France, besides in a rightly renowned zone, delicate for the dive because subject to the streams and situated in... the famous Ouessant rail. A navigation rail where circulates a quarter of the world traffic with about 150 ships every day. We easily imagine the numerous difficulties met by divers avid to go and dip their fins into this real highway devoted to the sea traffic ! 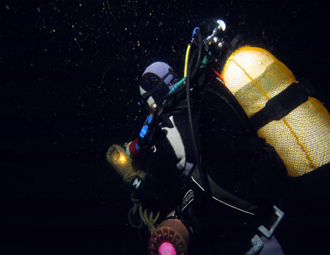 The professional cameraman Jacques Le Lay of the Sous la mer Production company was also of the part to film the totality of the action, so on surface as in-depth, and to immortalize this remarkable expedition with the aim of realizing a documentary. 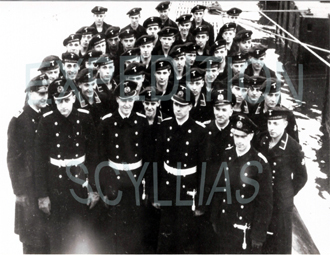 Centre : April 10, 1943 : the whole crew of U 741 during her commissionning, under the commandment of Oberleutnant-zur-See Gerhard Palmgren. Among these young men heading for certain death, only smiling Leo Leuwer (3rd row, 2nd on the left) will survive. (copyright). 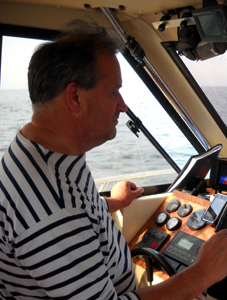 On the left : René Tamarelle is manoeuvring his ship, Manatee. Centre (l to r): a part of the team with Hugues Priol, Jean-Louis Maurette and Jacques Le Lay. 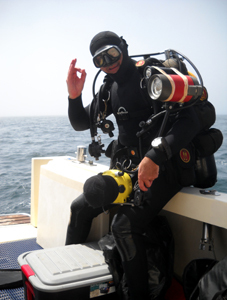 On the right : Jean-Louis and his loyal argentic camera ready to dive into History. A success for the team which so photographed and filmed U 741, U 413 and an unknown U-Boot, nowadays flooded graves forgotten by all. The operation also allowed to investigate the wreck given by Admiralty (the British hydrographic department) to be the one of U 671 and which turned out to be the one of... an enormous steamer ! Wrecks are laying from -50m to -65m depth and all the submarines belong to the famous type VII, the « draught horse » of the U-Bootwaffe and the archetype of the German submarine in the popular imagination. The remnants of these « grey wolves » who made the world tremble not so a long time ago are impressive of life and became, to the son of the years, real sanctuaries for the marine life which finds there a reassuring shelter. 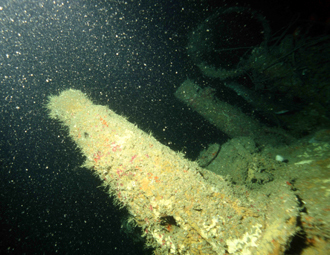 These historically and remarkable wrecks, very difficult of access, are the forever engulfed witnesses of this dreadful tragedy which rose up the world in arms during the last century. Also graves deserving the respect because one must never forget that within them crews of young sailors sleep for all eternity.